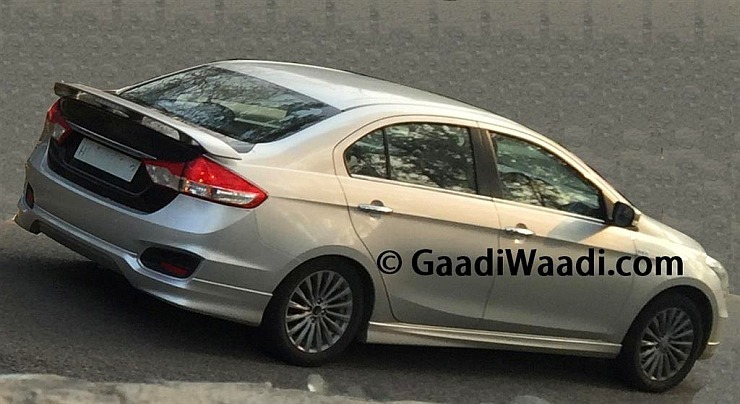 Spyshots of an uncamouflaged Maruti Suzuki Ciaz RS have emerged. The C-Segment sedan is currently the second best selling car in its category, only outdone by the Honda City in terms of sales. After a dip in December 2014, sales of the Ciaz in January 2015 have perked up. 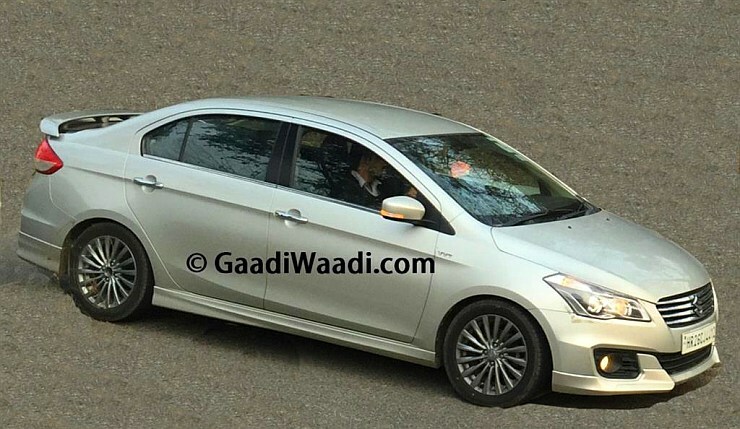 A replacement to the SX4, the Ciaz will soon be offered with a sporty body kit. Dubbed the Ciaz RS, the car will wear bumper inserts at the front and the rear, side skirts and a boot lid spoiler. A contrast vinyl decal on the boot will also be a part of the RS equation. The RS kit is expected to be available as a dealer fitment, at a price premium of about 30,000 to 40,000 rupees. A sporty looking body kit is what will differentiate the Ciaz RS from the car’s other variants. While RS originally stands for rally sport and usually involves major engine and suspension changes to make a car featuring this moniker a better performing version, the RS badge on the Ciaz will merely be a cosmetic addition to the car. The 1.4 liter K-Series petrol motor with 90 Bhp-130 Nm and the 1.3 liter Fiat Multijet diesel motor with 90 Bhp-200 Nm will continue to do duty on the C-Segment sedan’s RS variant with nary a change. Five speed manual transmissions will drive the front wheels of both variants with the petrol powered model gaining a 4 speed automatic gearbox as an option. The Ciaz RS is likely to be launched shortly, now that the car’s uncamouflaged spyshots have trickled out. Launched in the second half of 2014, the Ciaz hit bulls-eye for Maruti Suzuki, on the back of sharp pricing and spacious, feature filled interiors. India’s leading car maker is expected to launch the RS body kit equipped Ciaz shortly, as a measure to keep the buzz around the car alive even as rival automakers line up facelifts. For instance, the Hyundai Verna Facelift is less than 2 weeks away from being launched here, while the Vento Facelift is also in the pipeline. While facelifts have been the name of the game in the C-Segment sedan category, high performance variants of cars sold in this segment have been few and far in between. The only cars that appeal to enthusiasts, with performance to go with everyday usability in this segment are the Ford Fiesta Facelift, the Volkswagen Vento TSI and the Fiat Linea T-Jet. The last full fledged effort by an automaker to package a powerful engine mated to a chassis with sporty suspension was the Ford Fiesta 1.6S, a car that had a limited run. While sporty hatchbacks are now getting a fillip in India, similar offerings in the C-Segment sedan space are yet to take off.